BERLIN (Bloomberg) -- Audi said deliveries rose 7.7 percent in July as demand from China and the U.S. boosted sales to record levels in both regions. “In July we more than tripled sales of our imported models in China,” sales chief Peter Schwarzenbauer said in a statement. Chinese sales surged 53 percent to 20,537 vehicles while U.S. deliveries increased 22 percent to 7,817 units. Audi has a goal of dethroning BMW AG as the world's largest maker of luxury cars by 2015. Audi is targeting record sales of more than 1.08 million vehicles this year, an increase of 14 percent from 2009. Audi's forecast compares with a target to increase sales 10 percent at BMW and Mercedes-Benz's plan to outpace market growth of 4 percent. The Volkswagen AG division is targeting a return on capital in 2020 of more than 18 percent and a pretax profit margin of more than 8 percent of sales, the company said on May 20. 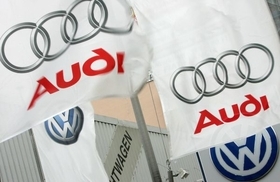 Audi contributed 1.33 billion euros to Volkswagen's first-half group operating profit of 2.84 billion euros. Volkswagen, Europe's biggest carmaker, aims to overtake Toyota Motor Corp. in deliveries and profitability by 2018, and it's targeting a second consecutive year of record sales in 2010.